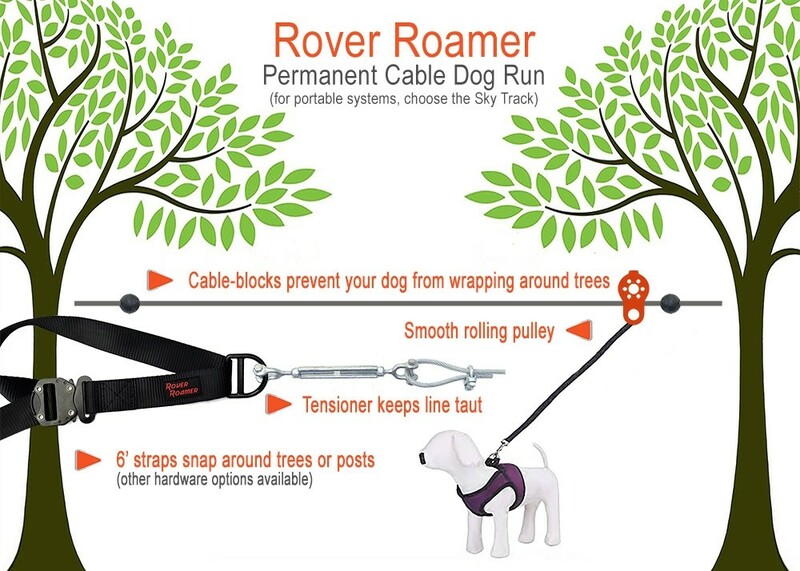 Tested for durability and safety, the Rover Roamer Cable Dog Run maximizes your pets roaming area in many outdoor situations and environments, such as fenceless yards and ranches. Also suitable for behavior management for chewing, digging, and runaway dogs. This is the permanent cable edition of the Sky Track featuring 1/4th" (6.35mm) aircraft cable, galvanized steel in a flexible 7x19 configuration with a clear vinyl coat, and easily modified for up to 3 dogs. 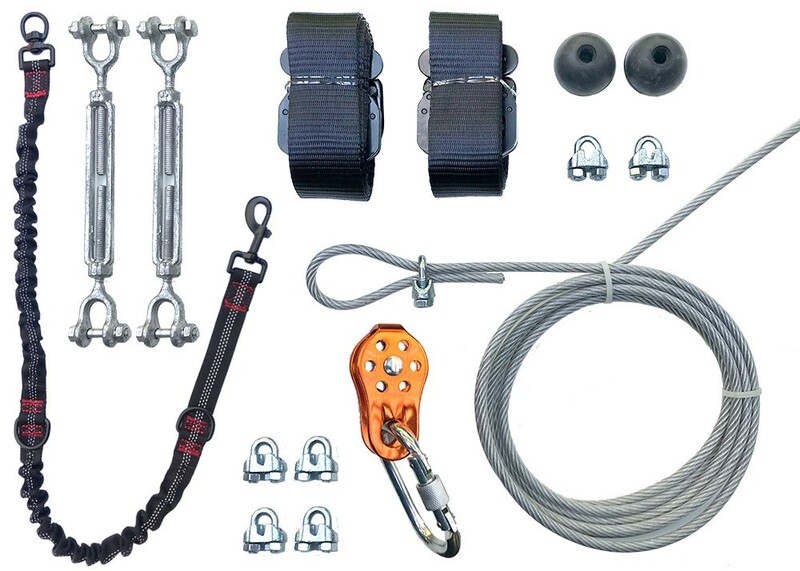 If you require a portable system featuring rope, ratches, and adjustable bumpers, ideal for camping, outdoor events, travel and more, go to the Sky Track page. 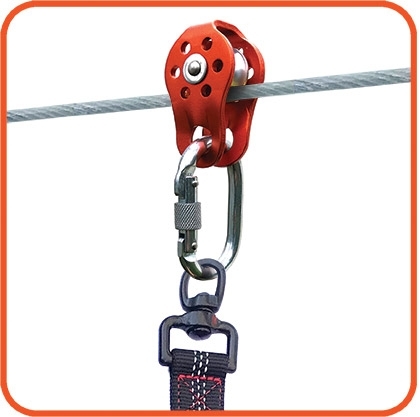 The Cable Run kit contains 50 feet of 6mm flexible cable, 1 pulley, 1 carabiner, 2x 6ft metal buckle straps with multiple hardware attachment options, 1 line tensioner, 7 cable clasps, 2 rubber stoppers, and 1 Neck-Safe Bungee Segment. The gear bag is optional. The line length determines the track length, customizable to 500 feet. 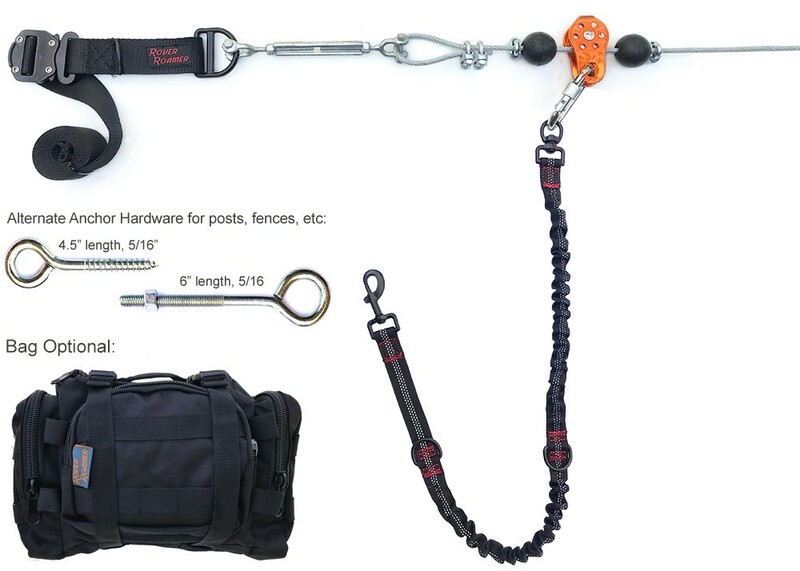 The pulley allows for smooth movement; the carabiner connects the pulley to the dog leash; each strap wraps around an anchor point (other options below include eye screws and bolts). 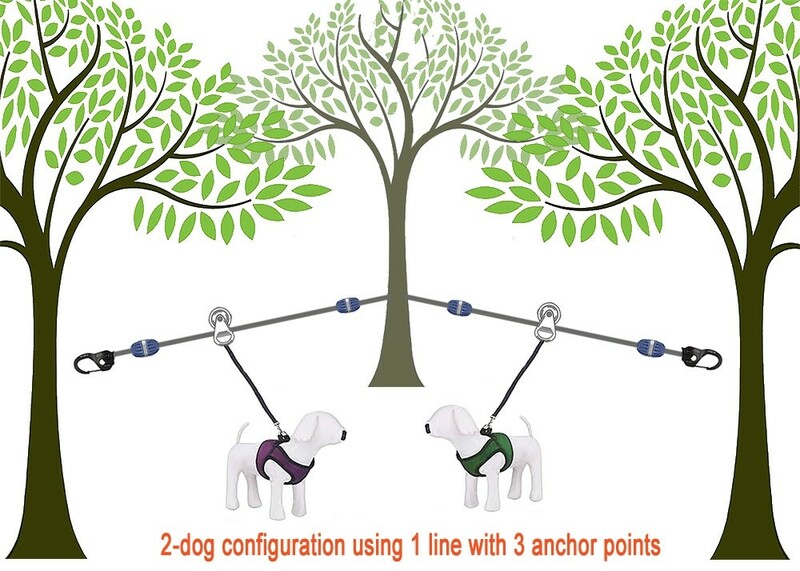 The cable line tensioner tightens the line; and bumpers create a safe distance from the anchor points to prevent the dog from wrapping itself around the tree or post. TIP: Getting someone to help you take as much slack out of the line before twisting the line tensioners will create a more taut line. However, if you're confident you can do it on your own, we recommend getting a ratchet strap from your hardware store (under $10) and connecting it between the Anchor strap D-ring and cable loop, then tighten just enough to get the slack out before adjusting the line tensioner. See the Problem Solving section on the cable system here. Cable Length and Anchor Points: Measure out the distance between your two anchor points and add 2 extra feet on each side. If you want a more precise cut, email us or call with the exact measurement. Various anchors exist, which requires its own specialized hardware. The 6ft straps can accommodate trees under 2 ft in diameter (6ft in circumference) so you don't have to screw straight into the tree. 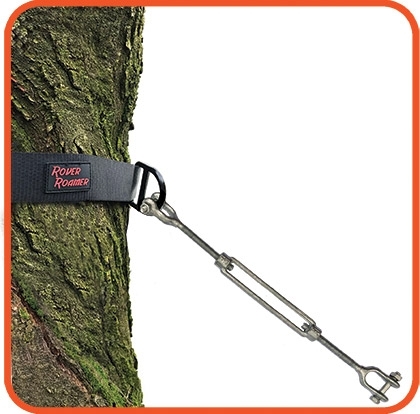 Add an extra strap and connect them together to make a 12 ft strap for extra wide trees. Other anchor point hardware options includes eye screws and bolts for posts, walls, fencing, and other wooden structures. Choose "requires customization" if you need special hardware for anchors such as metal posts, brick walls, etc. If you're not sure, call us or consult your local hardware store for advice. How many dogs on 1 line? 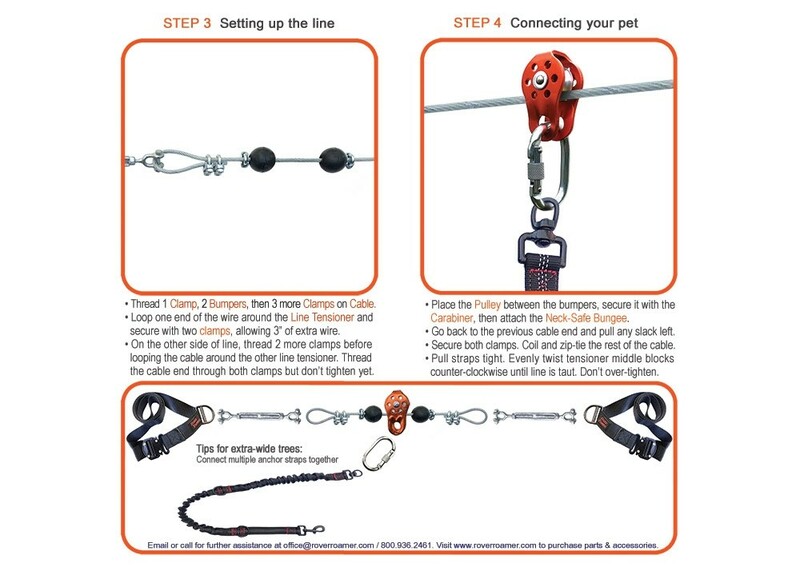 Dogs separated on one line requires an additional set of hardware (pulley, carabiner, 2 clamps, 2 bumpers). 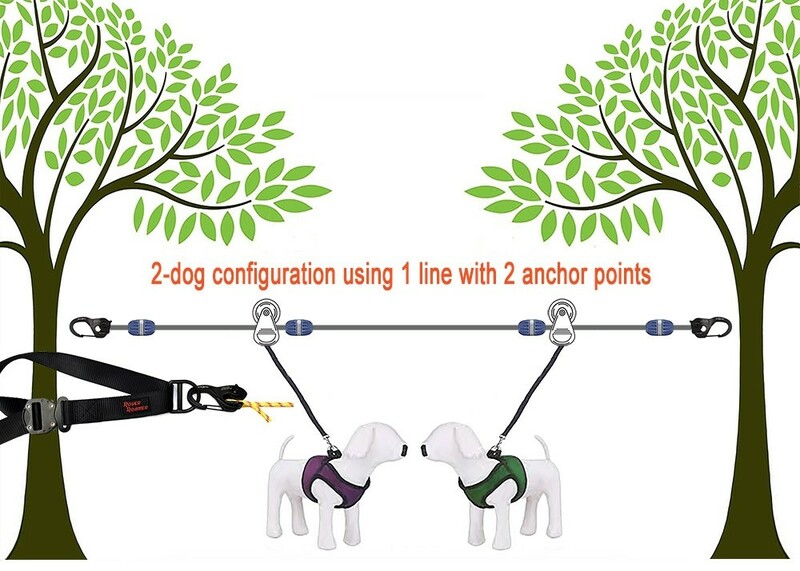 However, to save space along a short line, you could use the Bungee Leash & Convertible Coupler to function as a coupler leash (two dogs on one "V" leash configuration). They could interract without getting tangled up. Naturally, you'll want your dogs to have as much room as possible but the Coupler is a good way to give the dogs some play-time together. Because the line is usually placed overhead, a normal 6ft leash may not be long enough to reach the ground. For that reason, you'll combine the Neck-Safe Bungee Segment with either of our leash options or just use your own. Visit our Accessories Page to complete the system with leashes, harnesses, and pet supplies. Visit our problem-solving page for any concerns or dog behavioral issues you're having. How many dogs on 1 track? Thoroughly read and follow the instructions to ensure the highest level of safety for your pet. Deviating from the instructions may cause the system not to work properly, leading to your pet not being secured, getting wrapped up around the anchor points, or injury. It is recommended that you observe how your pet behaves on the track for some time before leaving your pet unattended. Then adjust the rope height, the leash length, the line tension, and the bumpers accordingly. Add enough slack in the leash so that there is no pressure around the collar when lying down. Harnesses are recommended. Set the rope height above most people’s heads to prevent injury from being “clothes-lined”. Disclaimer of Liability: Warranty is void immediately with improper use! Neither the manufacturer nor the vendor can be held liable for direct or indirect physical, property, consequential, or collateral damage resulting from the operation of this device. 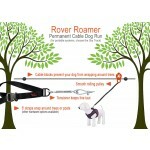 By using the Rover Roamer Sky Track, you agree with these terms. Find two trees, posts, or polls high enough so that the rope can run over the heads of most people.The standard strap is 7 feet long which will work on most trees but larger trunks may require you to combine two straps together to make one longer strap. Select your anchor points, such as a tree or post. just overhead. Thicker trees may require extra straps. If you're using other hardware such as eye screws and bolts that requires you to set a post or pole, make sure the cable is long enough to reach. Take into consideration that each end loop requires 12" of additional cable (2ft total). 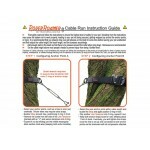 If using Anchor Straps, buckle one around a tree, positioning D-ring in front. Leave plenty of slack. Do not pull tight. 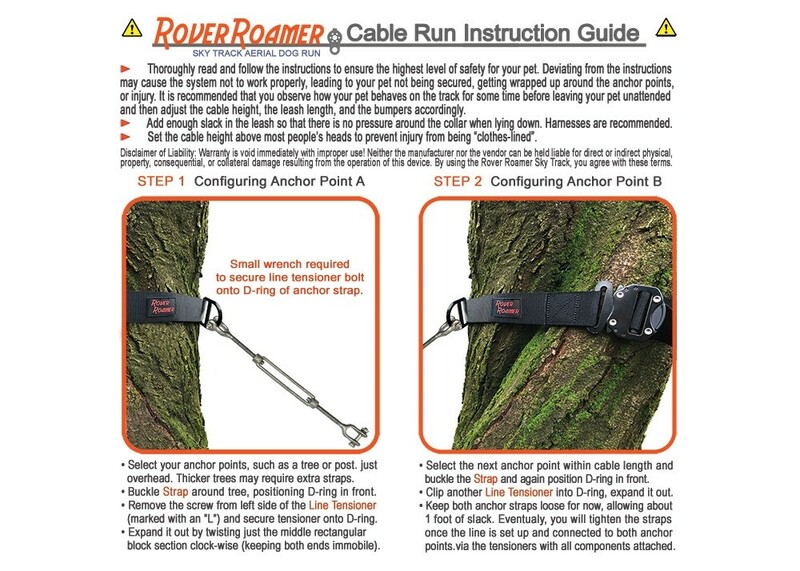 You will wait until Step 4 when the cable line is set up and connected to the anchor points before using the straps to pull as much slack out of the line as possible. This allows the turnbuckles to be employed with the greatest advantage. Remove the screw from the left side of the Turnbuckle (marked with an ”L”) and secure tensioner onto D-ring. Expand it out by twisting just the middle rectangular block section clock-wise (keeping both ends immobile). Leave about 1/4" of thread on each side of the middle section of the Turnbuckle. Your're done with Step 1. Walk over to the other anchor point. Turnbuckles help keep the line taut. You may need one or two depending upon the length of the line and how much help you have in setting up the track. The trick is to pull as much slack out of the line before using the turnbuckles. 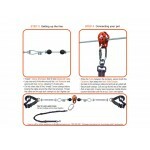 Select the next anchor point within cable length and buckle the Strap and again position D-ring in front. Again, keep the strap loose for now. Clip in another Turnbuckle into the D-ring and expand it out just like the last one. Now that you have configured Anchor Point A and B, it's time to set up the cable line. This step can be tricky. You want to estimate how much cable length you need to connect to the line by continuously adjusting one end of the cable until the line is strung between the two anchor points with just a small amount of slack. Thread 1 Clamp, 2 Bumpers, and 1 Clamp on one cable end if you have one dog. Repeat the process for each dog you intend to have on the track. Eventually the pulley will be placed between the two balls and the clamp/ball combination will act as the bumpers. Add two more clamps onto the cable line. Loop one end of the cable through the other Turnbuckle end and secure with these two clamps, allowing about 3” - 6" of extra cable. These two clamps can be fully tightened but leave the other two clamps an either side of the ball loose. You'll adjust the position of the bumpers later. Place the Pulley between the bumpers, secure it with the Carabiner, then attach the Neck-Safe Bungee. Now that one end is connected to Point B and all of the hardware is connected to the cable line, walk the cable back to Point A, unraveling the cable slowing and carefully. Thread 2 more clamps onto the other end. You will use these to secure the next cable loop. At this point, you'll estimate how much cable you'll have left over and where you should make that second loop so that it connects to Point A with minimal slack. For this reason, do not over tighten the clamps on this secondary loop as you'll be adjusting the length of the cable periodically. This is where it helps to have two people. Once you think you've estimated where the second loop should be in order to connect to the Turnbuckle on Point A with most of the slack in the line eliminated, tighten the two loop clamps just enough to hold the loop without it slipping. We have included a large carabiner to facilitate attaching the loop onto the Turnbuckle of Point A. 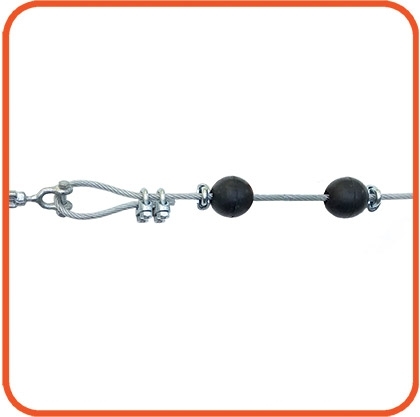 Try to eliminate as much slack in the line as possible by adjusting the loop position in the cable line so that you have to stretch the loop with some effort to connect it to the anchor point. Once you feel confident about the loop position, tighten the two clamps. coil up the rest of the cable and secure it onto the line with one of the zip ties we provided. Your line should look like this, pictured below, for one dog. 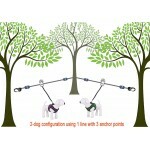 Each additional dog will have 1 pulley, 1 carabiner, 1 Neck-Safe Bungee, and 2 clamps and 2 balls. Adjust each clamp/ball away from the anchor points, trees, etc. and secure the clamp with medium torque. Its easier to move the clamp/ball when before the line is fully tightened. Go to one or two anchor points and pull the anchor strap as tight as possible to further tighten the line. Lastly, you will adjust the Turnbuckles to maximize tautness. When "L" is nearest the tree, turn the Turnbuckle middle block clockwise (to the left) to tighten. Observe if the inner bolts are screwing inward or outward (tightening or loosening). Placing a screwdriver into the middle of the block and turning it that way is much easier than trying to use your hand to turn it directly. 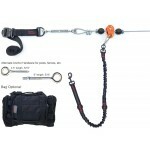 Attach the leash to the Neck-Safe Bungee and adjust the length so eliminate any pressure on the neck. Harnesses are recommended. 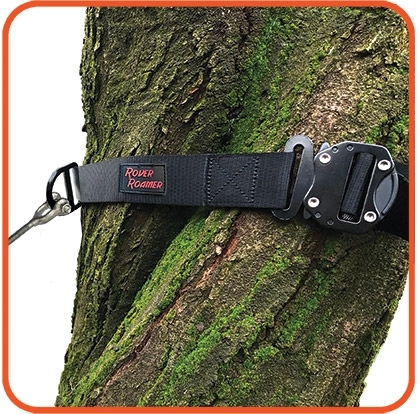 ATTACHING THE LEASH TO THE NECK-SAFE BUNGEE: The clip feature of the Bungee allows you to attach small and large leases, even retractable leashes, by clipping and looping around the leash handles and back onto the various bungee D-rings. Once you clip your leash into the Bungee Segment, make sure to use a leash long enough so that the dog can lie down and rest without putting any pressure on the pet, especially if using a collar instead of a harness. ACCESSORIES: We offer 6 foot retractable leashes and a duel-strength bungee leash to assist in providing stretch, safety, and responsible freedom for your pet. 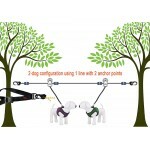 It also converts to a V-leash Coupler to allow two dogs on one leash to interract with each other without getting tangled up.